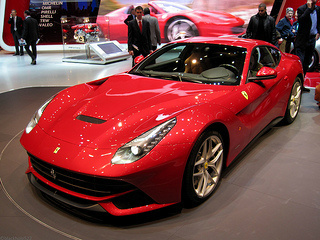 The Ferrari F12 sports car, launched at the 2012 Geneva Motor Show, was the natural successor to the 599 GTB. The car was built on an aluminium alloy space frame chassis the structure of which produced a weight reduction of around 70 kg whilst, at the same time, the frame's rigidity was markedly increased. Furthermore, it had been possible to lower the car's centre of gravity one inch, and moving it further back in the chassis, by lowering the engine, dashboard, and seats. 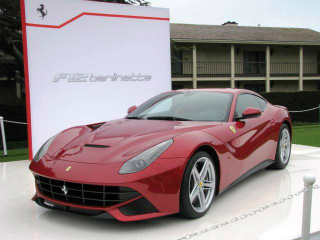 In terms of weight distribution, the F12berlinetta benefited from a 46:54 front to rear. Ferrari had applied the experience gained from work on the 599XX racer to improve the aerodynamic characteristics of the F12 sports car. One of the resulting features channelled the air flow from the bonnet and along the sides of the car to where it combined with the rush of air generated by the wheels to produce an effect that increased the amount of down force, and reduced drag. A further benefit was the introduction of cooling ducts to prevent the brakes from overheating. By so doing, they directed cooling air to the brakes, as and when required, and duly closed when the brakes had reached ambient temperature. The process of closing the ducts when not required reduced unnecessary drag, which contributed to the cars' drag coefficient of only 0.3. Another outcome was that the down force generated at 120 mph was 200 kg, a huge increase over that produced by the 599 GTB. Once again, Pininfarina provided a major input in the styling of the F12 sports car in which the interior featured leather upholstery together with air vents consisting of aluminium and carbon fibre. Furthermore, it had been possible to increase the internal capacity of the boot above that found in the 599. There was also additional luggage space behind the seats, which could also be reached by way of the tail gate. All these systems were controlled by the Manettino dial positioned on the steering wheel. The F12berlinetta was powered by a larger 6.3 litre, V12 engine that developed 730 bhp at 8250 rpm, and 509 ft/lbs of torque at 6000 rpm, of which most was available at around 2500 rpm. This resulted in the F12 being the most powerful road-going sports car built by Ferrari to date. Fitted with a seven speed dual clutch F1-Superfast automatic gearbox, and direct fuel injection, it produced a top speed of 211 mph, with a 0-60 mph time of 3.1 secs. On the other hand, Ferrari had indicated that, based on results from their own test track, the F12 was more than capable of reaching 225 mph. The efficiency of the engine had been further increased and, as part of the engine management system, it was fitted with the company's HELE sytem whereby, when the engine was in idling-mode, it was automatically turned off, and duly restarted when further movement was required. The benefit of this system was that the F12 sports car could now deliver fuel consumption of 18 mpg in city use, which represented approximately a 30% reduction when compared with the 599 GTB.